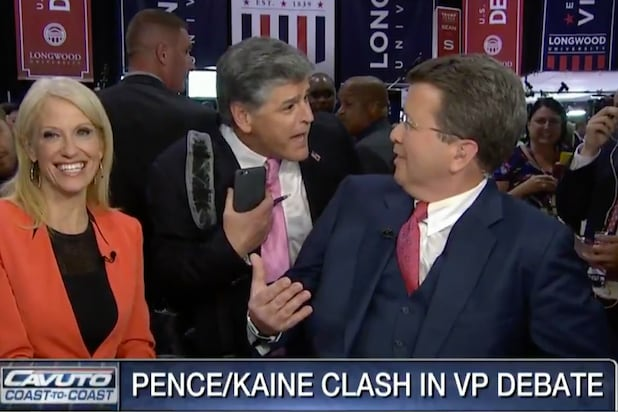 Sean Hannity crashed Neil Cavuto’s vice presidential debate coverage on Fox Business Network Tuesday, jokingly scolding him for not answering his emails. Cavuto, who recently missed a few months of work to recover from open-heart surgery, was interviewing Trump campaign manager Kellyanne Conway when Hannity hopped on the set. “I was getting emails from liberals and conservatives, Democrats and Republicans, the rich and the not-so-rich. We’re all joined at the hip in that human condition,” he said. Apparently one of the aforementioned Republicans was Mr. Hannity. Meanwhile, Conway appeared to be onto something with her joke, as the RNC has released a supercut of all 72 times that Kaine interrupted Mike Pence during the debate.